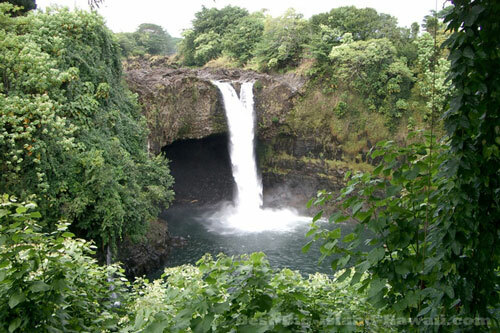 Rainbow Falls is a lovely waterfall on the Big Island of Hawaii very close to downtown Hilo. Because of its convenient location and easy access, it's one of the more popular waterfalls for visitors to the east side of the island. At about 80 feet high, it's not as tall as nearby Akaka Falls but has its own charms and is well worth a visit. Instead of one cascading stream of water crashing down to the pool below, you'll typically see two streams that are separate as they flow over the edge and then come together into a single stream before hitting the bottom. The shape of the falls varies depending on the the amount of water flowing. When the flow is very high, the two distinct streams will blend into one. The falls get their name from the fact that, in the right conditions a rainbow will appear in the mist over the falls. The falls face east, so your best bet for seeing a rainbow here is in the morning, facing the falls with the sun behind you. Whether you see a rainbow here or not, the falls are a worthwhile stop on any visit to Hawaii's east side. Getting there is easy. It's just a short drive from downtown Hilo. Take Waianuenue Avenue (one of the main roads in downtown Hilo that connects to Highway 19) for just over a mile and a half from downtown. Follow the sign for the falls and turn right onto Rainbow Drive. You'll see the park on your right with a large parking area. If you get to the Hilo Medical Center, you missed the turn. The main view of the falls is right next to the parking area and a few other nice views are available by following the trail. There's also an impressive banyan tree nearby. Another nearby waterfall worth checking out is Pe'epe'e Falls, which just upstream from Boiling Pots—a serious of pools that flow into each other on the Wailuku River between Pe'epe'e Falls and Rainbow Falls. As with other waterfalls in Hawaii, the view changes with the flow of water.